How food waste can be recycled and turned into resource to reduce rural and urban poverty and improve nutrition? We should avoid as much as possible any waste in the chain from (human) food production to consumption. However, from the farm to the fork, some waste is unavoidable. In rural areas, agricultural (processing) by-products and wastes from farming will be available while in urban areas it will be from distribution (centres) and final consumers. In Belgium and Netherlands, we have companies collecting vegetable and fruit wastes from supermarkets and distribution points and using it to feed insects. The dried insect larvae are then used in fish and chicken feed. In developing countries, poor urban people can collect food waste (usually for free) and use it to farm insects. In this way, we act at three levels: reduce the disposal of waste in the city, provide cash income opportunities and improve nutrition. There are many alternatives to traditional sources of protein such as algae, jelly fish and even laboratory-made meat. But why are insects the most promising? Insects are part of the food choice of about 2 billion people. They are part of the natural feed of chickens, fish and pigs. Insects provide us with good proteins, fats, minerals and micro nutrients. In addition to this, the feed conversion efficiency of farming insects is four times more than that of cattle. Farming insects requires less water and land and emits little greenhouses gases. In animal feed, the inclusion of insect powder may help reduce the use of antibiotics. Also, no antibiotics are needed to farm insects as compared to the high level of antibiotics used in chicken farming. Farming insects is socially more inclusive than say raising cattle, pigs or sheep, as insects are easy to farm, do not need huge investment or “high-tech” skills. Therefore, farming and processing of insects offer unique opportunities for business and jobs both in developed and developing countries, as it supports the local agro-economy by making animal feed cheaper and more sustainable. 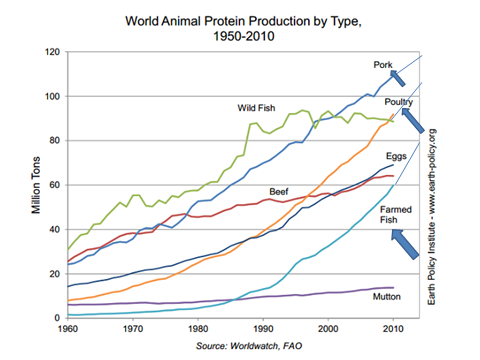 Why is the demand for protein exploding worldwide? How is this linked to rising income level? 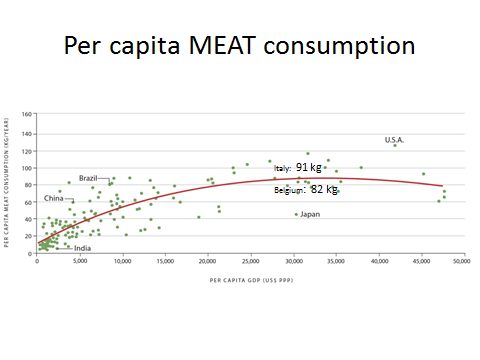 Everywhere in the world, increased incomes lead to increasing consumption of animal-based proteins (meat, fish, milk and eggs) as seen in the graphs. How can forests contribute to food security? Forests are important for a range of products and services, except for food production. That’s why humans invented agriculture. There are a range of products and services obtained from forests that are of relevance to food production and security. For instance, gathering of medicinal plants by indigenous people in India is very important for their livelihood, but it has very little relevance to Indian farmers or agriculture in general. Forest also provide (indirect services) relevant to farmers such as biodiversity (wild relatives of farmed plants can be used for genetic breeding) or the provision of water. What prospect India has in insect farming? How will insect farming be economically viable for the poor? In India, insects are already farmed such as bees, silk moth larvae and lacquer scale insects. In the north-eastern states (Nagaland for instance) indigenous peoples do regularly eat insects gathered from the wild. For India, the biggest opportunity is to farm insects (such as fly larvae and crickets) on vegetable and fruit waste to produce insect powder for use in animal feed. Poor people can have an economic opportunity here as they can collect the waste and farm the insects themselves in their backyards and sell insect powder to commercial chicken farms. 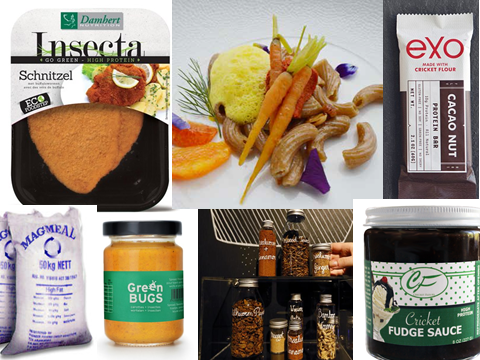 Is eating insects an expensive affair at present? It is both yes and no, depending on the case. If gathered from the wild like in Nagaland, it is probably not expensive. However, farmed crickets in Thailand sell for a higher price than chickens because people value them highly. To what extent will farming insects be of value to Indian farmers? Will not farmers rather keep cows here than farm insects as cows give us a lot of things? Insects supplement farming. Indeed, we still need cows (for milk and hides), but people can farm insects to produce cheaper animal feed ingredients for fish, shrimp and chicken farmers. Is there any other way to benefit from insects apart from direct consumption? Do you think it will be possible to popularise the concept of eating insects globally? Thirty years ago, eating raw fish in Europe (such as the sushi) was considered disgusting. Food habits can evolve over time, but of course awareness and information campaigns will be needed to tell people that eating insects is good for their health and for the health of the Earth as well. Many cultures do not eat insects. Not all Africans or Chinese eat insects. It is a cultural thing and Europeans are usually disgusted by it. Does India have regulatory stop for feeding poultry with insects? What prospect you think for exporting insect powder, say Thailand as it is mentioned in the article, above? Is their regulatory restriction on feeding poultry with insects in India? How about exporting insect powder to countries like Thailand -- does such market exist in India? If no, can it be built within existing regulatory ambit? Does India have regulatory stop for feeding poultry with insects? What prospect you think for exporting insect powder, say Thailand as it is mentioned in the article, above?and Is their regulatory restriction on feeding poultry with insects in India? How about exporting insect powder to countries like Thailand -- does such market exist in India? If no, can it be built within existing regulatory ambit?